Serial Port Monitor is a software to monitor Modbus data communications. This Modbus tester software displays and logs data transferred via serial ports in a system. 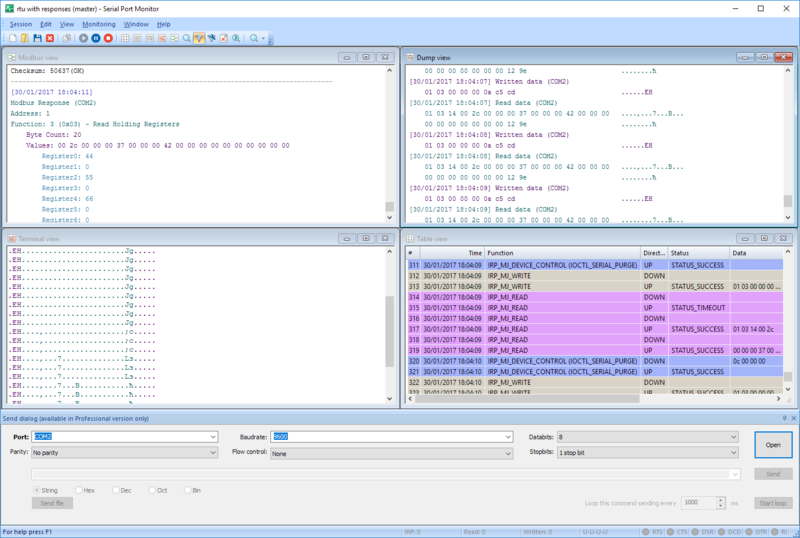 Further analysis of collected data allows you to detect and solve issues during Modbus testing and debugging. Additional features of this Modbus test program include search and advanced filters to view only relevant data, built-in terminal to execute text commands. The software can also export data in various formats. Clean user interface is an additional bonus to using the application. This Modbus test software is capable of connecting to any serial port, even if it is already in use by other applications. Monitoring starts immediately, and since it is conducted in a real time mode all potential problems can be detected and identified at an early stage. You can choose how you would like to view collected data, similar IRPs can be highlighted in different view modes for the purpose of comparison. Monitoring sessions can be saved and you can load them whenever required. This Modbus analyzer works both as Modbus RTU tester and ASCII data sniffer. This Modbus test tool allows you to keep an eye on several ports within a single session. You thus can watch several applications talking to various devices via several serial ports at a time. Monitored data is logged on a first-in-first-out basis making it simpler to analyze it. Table, Line, Dump and Terminal – these are modes offered for viewing collected data. Each has its own advantages and disadvantages, for example, Dump view is good for displaying binary, ASCII data and port settings - choose the one that suits your needs best. You can apply filters to view only relevant data; Capture options can be used during the monitoring process. In Terminal mode the software simulates transferring data from a monitored serial port to a device inserted into it. Formats supported include string, binary, octal, decimal, hexadecimal and mixed. This makes it possible to observe how the device responds to a specific command and data. To improve accuracy of Modbus communication test the software offers a playback feature – you can simulate Modbus data received from the application to the monitored port again. This will provide more precise results, comparing monitoring sessions will display differences between them.